Learn how to put your garden “to bed” by dividing plants, lightly pruning various shrubs, and updating winter pots at the Darien Community Association Greenhouse Group’s annual Free Fall Gardening Workshop next Tuesday, Oct. 16. Novice gardeners will be given tips; experienced gardeners are welcome to just help out. This event is free to all. 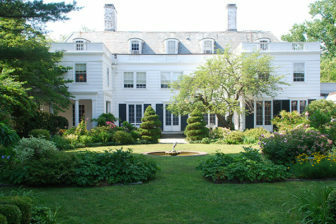 The Darien Community Association’s Meadowlands estate on Middlesex Road. The workshop takes place Tuesday, Oct. 16 from 9:30 a.m. to 12:30 p.m. in the formal garden of the DCA Meadowlands, located at 274 Middlesex Road. The day begins at 9:30 a.m. (coffee will be available); all are welcome at any time throughout the morning. Children are welcome under their parent’s/guardian’s supervision. Reservations are requested to ensure there’s plenty of lunch for all, and can be made online at the DCA website, or by contacting the DCA at info@dariendca.org or 203-655-9050 extension 10. Appropriate clothing for gardening should be worn, and all are asked to bring any hand tools available (trowel, hand shovel, clippers; the group will have some extras for those who don’t). Afterwards participants will enjoy lunch on the patio.